"Top 10 space program Headline News jokes"
10) America won the space race launched by JFK, until it chose to lose the future of space exploration grounded by public apathy and unfunded debt. 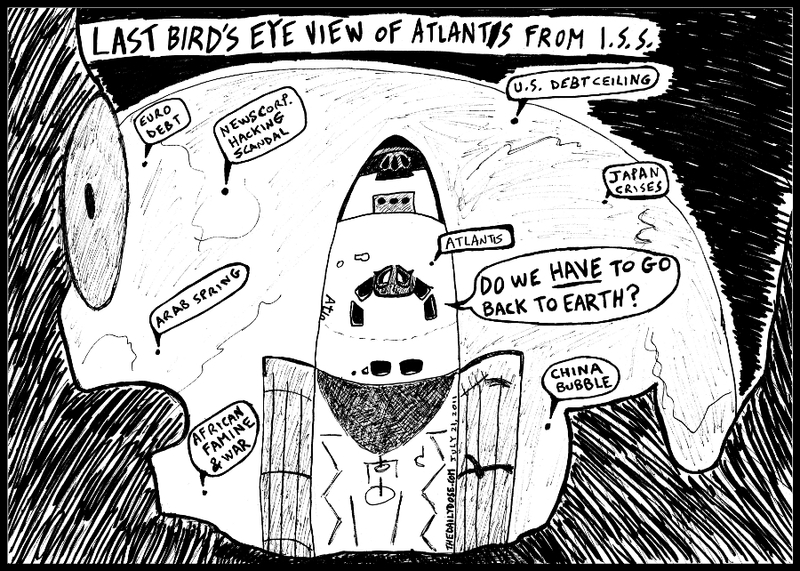 9) Politicians argue that after fifty years of space exploration, NASA has run out of things to do above the Earth that can help get them reelected. 8) China is sad to see the NASA Space Shuttle program end, because now it will be harder to sell their fake space shuttle copies. 7) News Corp. says that the News of the World phone hacking scandal was first discovered by a space shuttle astronaut orbiting the Earth and listening in on Rupert Murdoch's voice mail. 6) Now that NASA is ending its space shuttle program, Google says it will enjoy the extra office space at their joint headquarters. 5) NASA is going to keep the space shuttle Atlantis in a museum after its final landing, and only wishes it could round up the politicians that killed it and launch them to deep space. 4) Now that the Space Shuttle program is retiring, will it spend more time on facebook or Google+? 3) As it took one last lap before landing at Cape Canaveral, Florida for the last time, the space shuttle Atlantis astronauts thought about all that they'll miss about being in space, chiefly the insanity of humanity on Earth. 2) There's nothing quite like watching a Space Shuttle landing, and the U.S. Government has made sure there will never be anything like it again. 1) You could hear a pin drop when the Space Shuttle Atlantis touched down for the last time, and you could throw a pin higher than NASA could launch its own manned vehicles.